Modern American poets translate classical Chinese poetry. A rich compendium of translations, The New Directions Anthology of Chinese Poetry is the first collection to look at Chinese poetry through its enormous influence on American poetry. Beginning with Ezra Pound’s Cathay (1915), the anthology includes translations by three other major U.S. poets––William Carlos Williams, Kenneth Rexroth, Gary Snyder––and an important poet-translator-scholar, David Hinton, all of whom have long been associated with New Directions. It is one of the first general anthologies ever to consider the process of translation by presenting different versions of the same poem by multiple translators, as well as examples of the translators rewriting themselves. A playful and instructive study into the art and tradition of Chinese poetry, this anthology gathers some 250 poems by nearly 40 poets, from the anonymous early poetry through the great masters of the T’ang and Sung dynasties. It also includes previously uncollected translations by Pound; a selection of essays on Chinese poetry by all five translators, some never published before in book form; Lu Chi’s famous “Rhymeprose on Literature,” translated by the eminent scholar Achilles Fang; biographical notes that are a collage of poems and comments by both the American translators and the Chinese poets themselves; as well as Eliot Weinberger’s excellent introduction that historically contextualizes the influence Chinese poetry has had on the work of American poets. 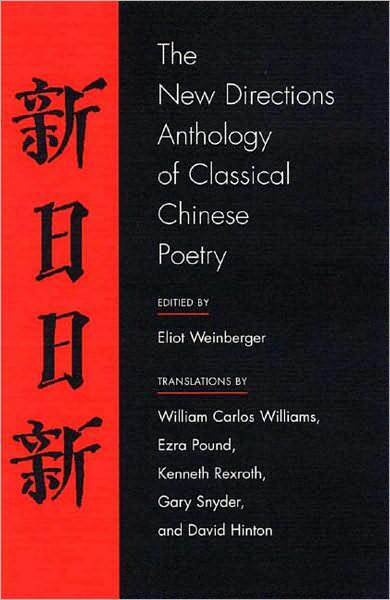 Weinberger’s anthology presents both the range of classical Chinese poetry and a catalogue of translations to compare and contrast… With such many-sided and multifaceted viewing, the reader ends up with a richer, more developed sense of the poems and their literary tradition… and of the Chinese poetry itself, as close to the original in spirit and in letters as any volume can hope to achieve.